Archived article: This specific apartment wasn't available for rental the last time we checked, but we've left our article online as an example of what you might find if you book a lower-end vacation apartment in Venice. The apartment is likely to be a better value, since a multi-room holiday flat is often no more expensive than a double room in a three-star hotel. You'll have more space, with a kitchen and possibly a washing machine for clothes. You'll feel like a resident of Venice instead of a tourist. 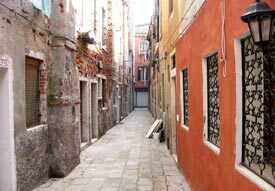 ABOVE: The holiday apartment (right) is on a quiet side street near the Campo Santa Maria Formosa. INSET BELOW: Doorbell and brass plate. A few years ago, my son and I rented the "Rialto Bridge 2 Laura" apartment in Venice's Castello district, a few blocks from the Campo Santa Maria Formosa and about a 10-minute walk from the Piazza San Marco. The furnished apartment had a large living room with a dining table, a bedroom, a kitchen with a washing machine, and a bathroom that opened onto a private courtyard with a clothesline. The price was extremely reasonable: less than the cost of many three-star hotel rooms. For information on how to reserve the "Rialto Bridge 2 Laura" apartment through Venere, our Italian booking partner, see the booking information page. You can also click here or use the navigation table below to take a photo tour.